if i can get my act together, i would love to have a little holiday party this week now that my house is finally feeling more complete. i asked the bash, please girls to show us how to make a cool centerpiece for the party. check out what they made! 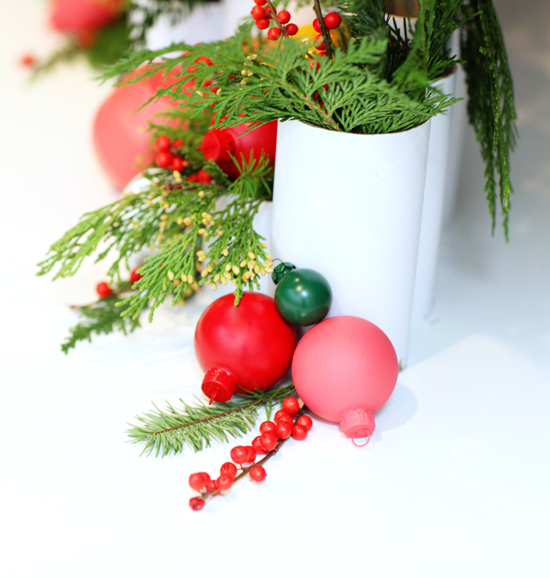 We wanted to create a centerpiece that is festive, yet simple (and inexpensive!) to put together. We headed down to our office supply store and purchased white shipping tubes in a variety of widths, which we then cut into different heights. 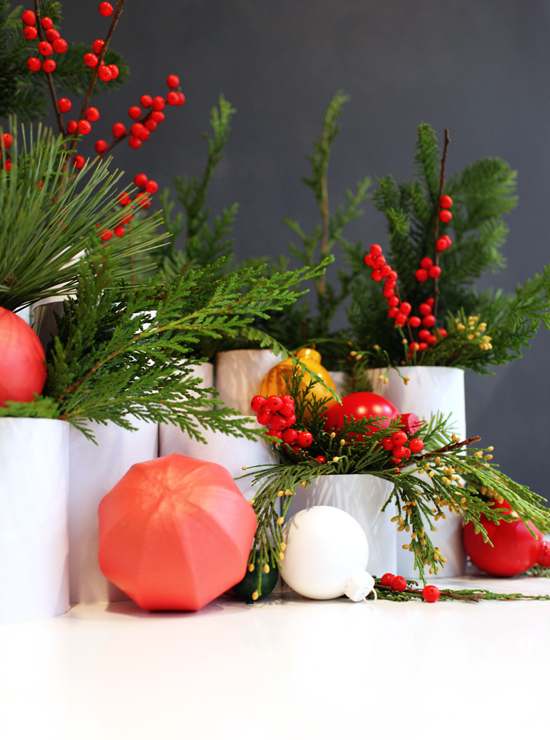 We took a variety of papier mache and glass ornaments and spray-painted them in matte paint from top to bottom in shades of pink, mustard, red, green, and white to create a bright color palette for our table. The greens for the table were scraps we got at our neighborhood Christmas tree lot – we made sure to ask for scraps of different types of trees to give the centerpiece a varied texture. The red berries were purchased from the LA flower mart. Once we had all of our supplies together, we began building the structure of the centerpiece. Starting from the back and working our way forward, we created an asymmetrical display of shipping tubes, making sure to keep the shortest tubes in the front. If you plan on having your centerpiece visible on both sides, you’ll want to place some shorter tubes on the other side as well. With the installation complete, we tucked sprigs of greenery into the tubes and added the red berry branches for pops of color. 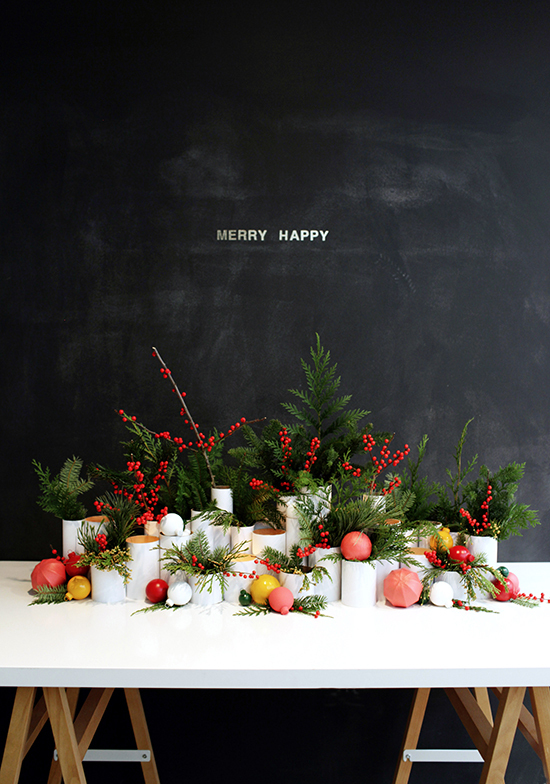 Simple gold stickers, also from our office supply store, were placed on the wall above the table to spread holiday cheer. 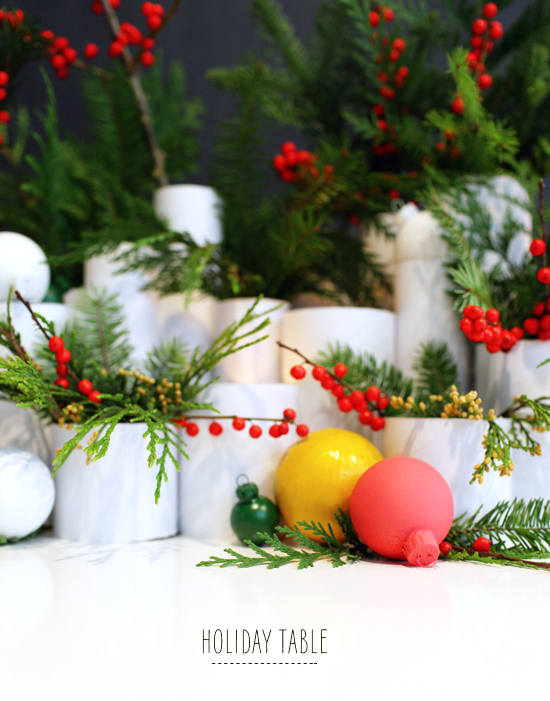 We set the finished ornaments throughout and for a final touch, votive candles were placed inside some of tubes to add a soft glow and warm ambiance to the table. I love it!! I wnat to make this for my NYE dinner party!! This is so easy and festive! Thanks! I am totally digging this! I am a mad woman for a good centerpiece! 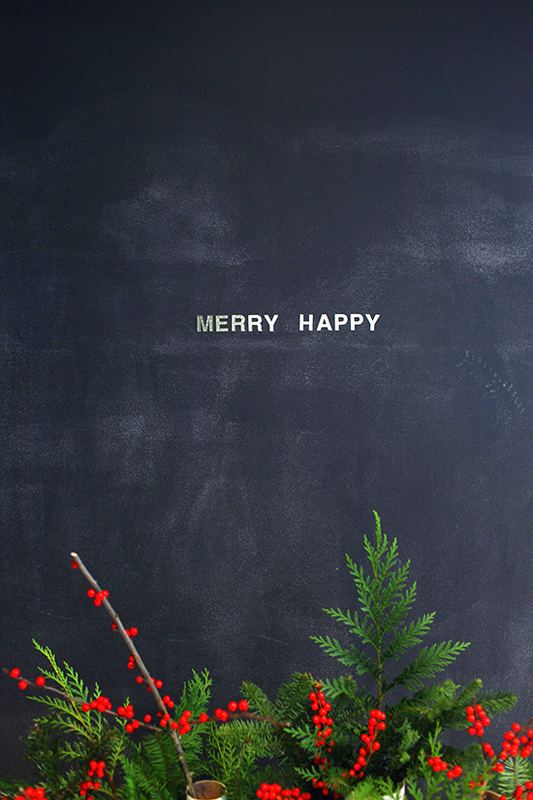 Pingback: tuesday tunes, v.07 [holiday edition no.3] » hk in love. That is a gorgeous centerpiece! I love how the ornaments were painted one color. So modern! Cute! I love the spray painted ornaments. This is definitely the best centerpiece I have seen this season. Love the colors & the tubes. love the spray painted ornaments. Live this! Is that chalk paint?? I want a chalkboard wall but can’t decide on best brand.. Who did you use ? Commonly I really don’t understand write-up in sites, nevertheless i want to claim that that write-up incredibly required me personally to undertake that! A person’s writing style have been astonished me. Many thanks, really excellent write-up. Hi colleagues, its great post regarding cultureand entirely explained, keep it up all the time. This is gorgeous and I’m going to use it on my mantel this year. Love this easy idea! I use clean soup cans that I spray gold and/or silver and do center pieces and decorations…they are so versatile.. I think that it would look even more beautiful if there is a few candles.